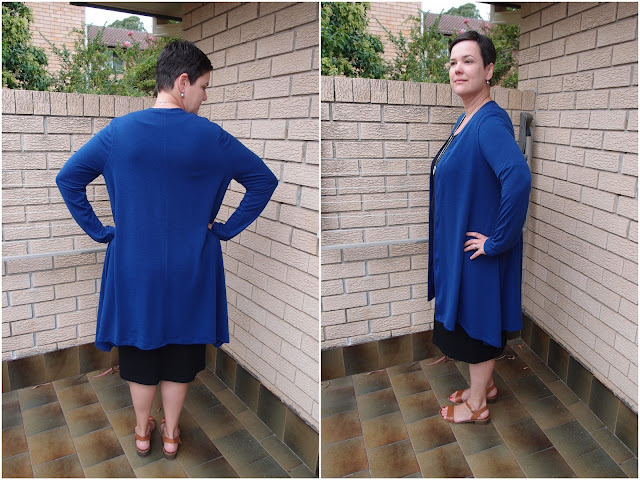 When I was in Tessuti's Chatswood store last week I tried on a Megan Longline Cardigan sample that they had made up. I love seeing sewing patterns made up especially if it "sort of fits" and I can try it on. It helps me decide if the pattern will work for me before all the hard work of sewing the thing! The cardi I tried on in-store was a Size S, so it was a good assumption that the bigger sizes in the pattern would fit me...and it does! Woot! I sewed a Size XL...my usual tactic is to sew the biggest size on offer and it usually works. The cardigan fits very well...though of course my right arm/shoulder doesn't feel very comfortable in this...but this is my shoulder's fault (I think I need to figure out what the issue is with my shoulder and how to adjust a pattern for it). The fabric is from My Hung in Parramatta and is a polyester/spandex blend. It's somewhat stretchy, but next time I want a bit more stretch as I think this will help with the comfort factor. I really want to find some nice fabric in black for my next cardi. I found this a pretty simple garment to sew and the instructions were pretty good. I didn't feel lost once and only read ahead a few steps at a time to ensure I didn't get myself too confused by reading the whole pattern before I started. The only change I made to the pattern was to widen the neckband by about 1cm. It's a pretty narrow piece and I just wanted the extra width to ensure the band was easier to handle. I like the way the neckband and hem meet, and mine looks very similar to how the in-store cardi looked. Also happy with my top-stitching...it's pretty neat (and straight) for me. 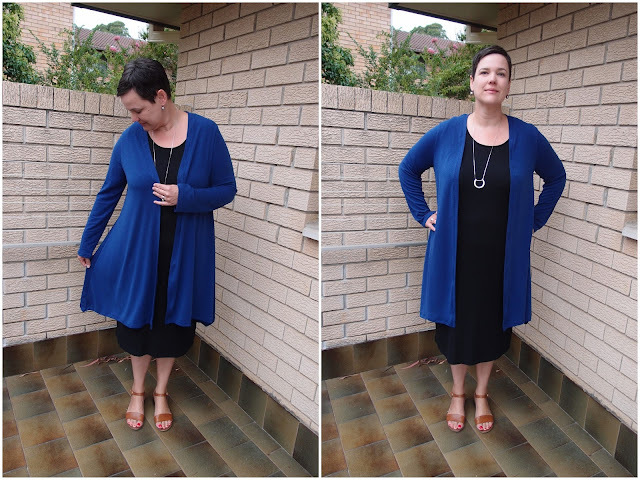 I wore this cardi to work today -- as shown in the pictures, and I'm super keen to make a black one ASAP! The shape is perfect for winter with skiny pants and boots! At least I know what fabric I'll be shopping for this weekend! Size: XL, sewn with 3/8" seam allowance. Modifications: 1cm added to the width of the neckband piece. Changes for next time: I might tapper in the sleeves at bit at the wrists as I'm finding them a tad wide.